Türk Telekom International has an extensive dark fiber network all over Europe and in Turkey. The overall length of the Türk Telekom International DF network is more than 40 000 km. Dark fiber (DF) is a network infrastructure in its crudest but most flexible form. 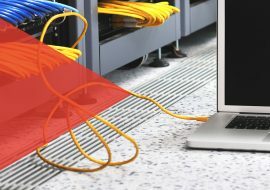 The expression dark fiber is used for fiber optical pairs that are not lit, which means it is not connected to equipment. The customer “lights up” the fiber by connecting his own equipment to the fibre. At both end points of a link a so called terminal is installed. These terminals provide interfaces to the different capacities that are to be transported between the end points. Amplifiers (or repeaters) are installed every 50 to 130 Kms to give the signal the needed power in order to reach the next amplifier or end point. The end point locations or PoPs (Point of Presence) which are chosen by the customer are connected via a series of intermediate amplifier sites which are the standard Türk Telekom International locations equipped with all the industry standard facilities are necessary for securing high quality conditions for the customer equipments. The customer co-locates his rack with equipment in these sites within a footprint. Dark Fiber Indefeasible Right of Use (IRU) based on the customer can use the dark fibre pair as its own during the term of the contract which is usually stretches from 10 to 20 years. Türk Telekom International provides Operation & Maintenance services and co-location services as part of the package. Dark Fiber lease: based on the customer leases the fibre pair typically for a shorter period of time. O&M is provided as part of the package, co-location is optional depending on the customer needs. Cable Duct IRU: Türk Telekom International provides a cable duct dedicated to the customer. Attenuation: The loss of the light-power from A end to B end. The needed amplifier locations between PoPs can be calculated based on this. The characteristic value of a cable are defined as attenuation/m at a specific wavelength based on which teh total attenuation of a cable can be calculated. CD (Chromatic Dispersion), PMD (Polarization Mode Dispersion): The dispersions cause the distortion of the optical signal. In the worst case the DWDM could not differentiate the received signal, between ‚0’ and ‚1’. This is an important parameter for planning the DWDM routes, to compensate the effects of dispersion. Türk Telekom International offers dark fibres based on G.652 and G.655 ITU-T standards. Türk Telekom International is the only supplier that can provide full redundant Dark Fiber routes on the Istambul – Frankfurt section. Türk Telekom International can offer dark fiber solutions according to ITU-T G.652 standard, which is the most common one, on all routes. G.655 fibres are also available on specific sections of the Türk Telekom International network. The network topology is built according to customer needs. Türk Telekom International completes its existing fibre optic network with the missing sections from third party providers to meet the customers’ specific requirements. The Türk Telekom International Fiber optic network is fully managed by Türk Telekom International local professional teams or by the Türk Telekom International contracted local experts.